The Colorado Parks and Wildlife Commission has approved a plan to kill some mountain lions and black bears. 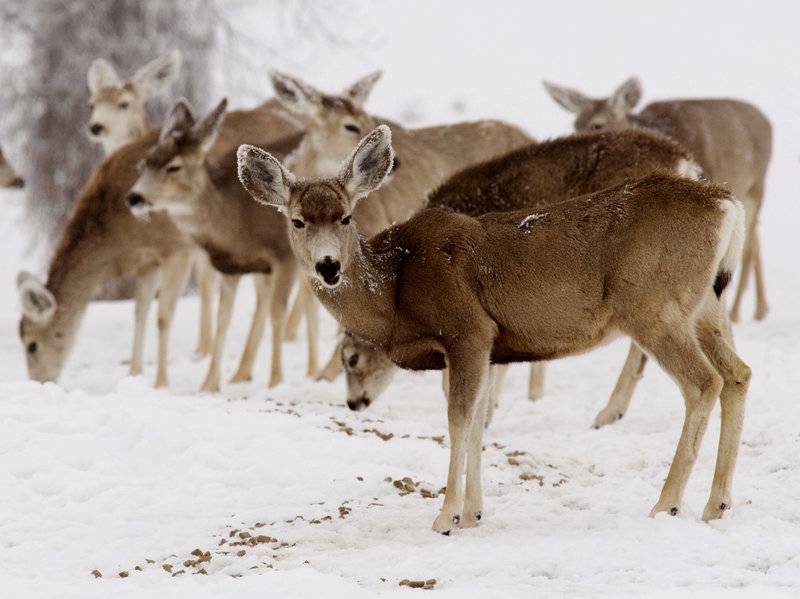 It's part of a plan the commission hopes will decrease the number of predators to help boost the state's mule deer population. Under the plan, state wildlife crews will capture and kill up to 15 mountain lions and 25 black bears each year in the Piceance Basin of northwest Colorado beginning in the spring of 2017. The state said it would also pay $435,000 per year for a nine-year study of the "effects of mountain lion population density on mule deer populations." The Fort Collins Coloradoan reported the total cost of the wildlife population management plan will be $4.5 million. The state estimates more than 400,000 mule deer live in Colorado, which the Parks and Wildlife Commission says is about 80 percent of the target population. Disappearing Mule Deer A New Reality Throughout Western U.S.
Colorado allows people to hunt mule deer each year if they obtain a permit from the state. The required licenses cost $34 for Colorado residents, and more than $300 for hunters from out-of-state. Last year, about 34,000 mule deer were legally killed by hunters in Colorado according to the Parks and Wildlife Commission. On its website, the commission said its motivation was not to sell more licenses to hunt deer. "Revenues were not a factor in determining where and how to proceed," it says on a page titled "Predator Management Q & A." " 'We find it surprising that [Colorado Parks and Wildlife's] own research clearly indicates that the most likely limiting factors for mule deer are food limitation, habitat loss and human-induced disturbance – not predators,' [Colorado State University] biologists Joel Berger, Kevin Crooks and Barry Noon wrote in a Saturday letter to CPW commissioners. "The biologists point to vast deer habitat in Colorado that has been fragmented by roads, damaged by oil and gas drilling and rendered inhospitable for wildlife by other development.
" 'We do not understand why compelling scientific findings based on research conducted in Colorado by CPW researchers is not being used to better inform management actions to benefit mule deer,' they wrote. 'This seems both illogical and a waste of public funds. The scientific consensus is clear and compelling – predator control is a costly and ineffective management tool to increase mule deer populations.' "
On its website, the Parks and Wildlife Commission refuted the biologists' claims, writing, "Ongoing research in the Piceance Basin suggests predation rather than other factors (habitat, energy development) is most likely limiting this population." "Habitat is a primary focus in other areas where habitat may be more limiting than the two areas where the influence of predation is being examined," it continued. Colorado's Mule Deer Story from Colorado Parks & Wildlife on Vimeo.